Virginia Wright Wall was born at Emanuel Hospital in 1927 to a family that moved to Portland from Connecticut in the early 1920’s. One of two daughters, Virginia and her younger sister learned to bake early in life, preparing several loaves of dark molasses bread every Sunday morning, and then making “daddy’s favorite pies” while the oven was still warm. They soon found that turning the heat off halfway through the pie-baking process gave their pecan and mincemeat pies the tenderness that never failed to delight all those invited to their Sunday Suppers. 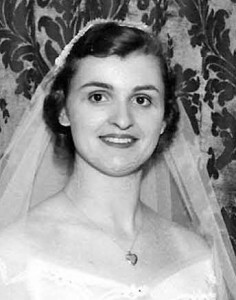 Virginia met her husband, Bill, right after he returned from back-to-back commitments in World War II and the Korean conflict, at an after-service function at St. Marks Church in Northwest Portland in 1954. They dated twice, then Bill introduced her to a friend of his, thinking they would be the better match. One evening, Bill, out on a date with a different girl, bumped into Virginia and his friend while they were out on a date. Bill and Virginia ended up talking the night away, and married the following year – 50 years ago on May 14. Three sons followed during the ensuing eight years, and the Sunday Suppers once again reigned. Later in life, after attending University of Oregon and a stint working for U.S. Bank, Virginia became an R.N. and ICU nurse at the same hospital where she was born, and continued working there until her retirement after twenty-four years of service. As they celebrate their golden anniversary this month, we celebrate Virginia’s good cooking with you. Enjoy!